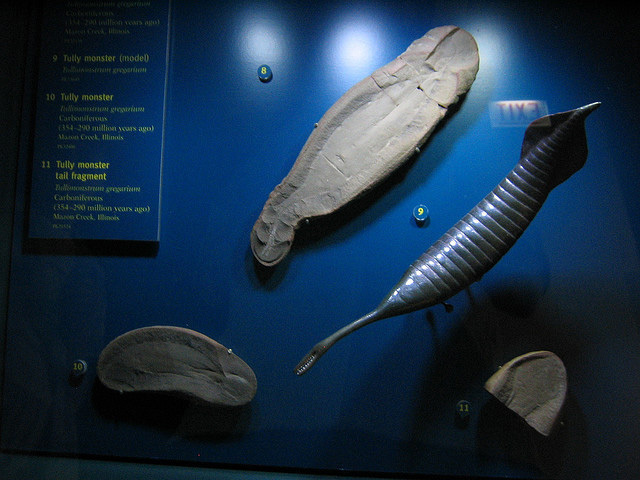 Tully monster fossil and model at Chicago Field Museum; photo by Brian Smith (brianbrarian) on Flickr (noncommercial use permitted with attribution / share alike). The Tully monster was a soft-bodied prehistoric marine animal which lived 280 to 340 million years ago during the Pennsylvanian geological period. So far Tully monster fossils are unique to Illinois - more than 100 Tully monster fossils have been found in the state (amateur collector Francis Tully found the first in 1958).